Does your food allergic child wear a medical ID? Here is the importance and positives of why they should. We have our emergency action plan, a trusted allergist, and always carry two epinephrine auto injectors. All this preparedness is key to keeping our kids safe. A medical ID plays a key role in the life of food allergic children. Throughout the past 7 years since my son’s diagnosis, there was a time in the beginning when I thought “well he is my care so what is the need for a medical ID?” This food allergy journey changed my thoughts quickly. 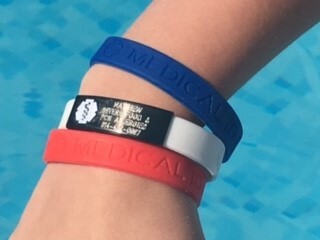 My son is almost 9 years old and never leaves home without his medical ID bracelet from American Medical ID. Let me help save you from learning the hard way of why it is so necessary and important to always wear your medical ID. No one wants to think about that dreadful day when an emergency comes around. The fact is you must be prepared in every way to ensure your child is treated properly for anaphylaxis. 95% of first responders immediately look for a medical ID in an emergency. They need to be able to treat your child effectively. Knowing if there are allergens to foods, medications or otherwise is pertinent to them doing so. You may not always be able to speak for your child if they are not in your care. The medical ID gives those helping your child the information needed regarding their medical conditions. Your child may be in a situation where they cannot speak for themselves! A Medical ID gives those in your child’s life daily the information they will need. Such as school nurses, teachers and caregivers. If your considering using an iPhone or technical device, you may want to think again. A medical ID bracelet, necklace or tag is assurance that when your child needs help they will receive. It is reliable. Emergency responders are trained to look for medical ID’s. Technology devices may not be as reliable, if they are not present at the time and it can be very time consuming trying to figure out how to get into a technical device. During an emergency like anaphylaxis there is not a minute to waste. A Medical ID Can Start a Conversation! The food allergy conversation can be challenging for younger children. They want to fit in and be included. For some it may be that they are too young to start the conversation. A Medical ID from American Medical ID can be a great conversation starter! Wearing a Medical ID can open a conversation in a positive way about food allergies. It can show the seriousness of food allergies to others. It can be a great tool to educate others! Your child wearing a Medical ID can empower them. When they become of the age to talk about their food allergies their ID can help them feel confident when doing so. It is assurance for your child, to know that when they are not in the safe haven of their own home, those who will be caring for them know their allergies if there was an emergency. It helps your child advocate for themselves as they get older. When a child wears a Medical ID and their friends see it they are bound to ask questions. It can help your child have the conversation, it can help their friends in supporting them and keeping them safe. A medical ID bracelet can help even with adults. It shows those in your life the seriousness of your child’s food allergies. It brings the conversation of importance to the surface. This is an important part of wearing a Medical ID. Your child should be comfortable wearing it, to ensure they will keep it on. With younger children that can be a challenge. Necklaces are always a great option for those whom the bracelets don’t work for. Let your child help choose the medical ID, this will let them feel it was their decision. My son LOVES his ID bracelet and has helped in the process of picking his own out since we began our food allergy journey. Make choosing a Medical ID fun! Let your child choose their own style. This will help encourage them when it comes to wearing it. Choose a reliable company. We love American Medical ID for our bracelet needs. They have so many colors and styles to choose from. Get more than one! We have two different styles of ID bracelets. We used a stainless steel one when my son was younger and now have moved onto a silicone one. We have found this useful during the summer months and for activities. Making your child part of the process will help to educate them on their own allergies. My son now at the age of 9 helps to create what will go on the ID bracelet. I love seeing him do this, he knows what important facts are needed on the ID in case of an emergency. Customize your Medical ID with engraving suited for your needs. Not sure where to start or what to put on the ID? When working with American Medical ID their staff is there to help through the process of what to put on, abbreviations and what styles work best to accommodate your needs. Make medical ID’s part of your emergency care plan. It can be life-saving for your child. Pamela Fernandez is a mother of a child with multiple life-threatening food allergies. She Co-Founded Navigating Food Allergies in 2015 and is a support group leader for the nationally recognized No Nuts Moms Group, which is also a FAACT-recognized support group. She is working with local food allergy pantries to supply those with LTFA necessary items that are needed and safe. She is developing F.A.S.H Food Allergy Sharing Hope for this purpose. She spends her time as an advocate and facilitates fundraisers in her community, schools, libraries and churches. Pamela continues to raise awareness and share education about those who live with life-threatening food allergies.